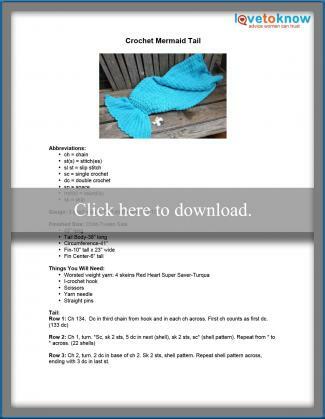 Make your little mermaid smile in this cute and cozy crochet mermaid tail blanket that is constructed like a bag. This crochet pattern features a shell stitch to resemble fish scales throughout the entire body. Intermediate crochet skills are recommended for this pattern. This pattern is a child-tween size design and will fit someone who is four to five feet tall. It has an opening in the back that allows the tail to be wrapped around the body as tightly as your little fish would like. Click on the image below to download and print the pattern in Adobe. Big girls like to be mermaids too, and with a few tweaks to the pattern that wish can come true. Use these tips on where and how to make adjustments to the pattern to enlarge the tail. Adjustments are based on the finished size of the child-tween size. Be sure to read the finished size measurements of the tail to determine how many extra stitches, rows and rounds are needed for your customized fit. You will need five skeins of Red Heart Super Saver yarn to enlarge the tail to an adult size. Increase the circumference of the tail by increasing the chains in Row 1 in multiples of six. Add five rows to the tail before connecting to work in rounds. In the pattern, the connection to rounds is Rnd 46. For enlarging it will be Rnd 51. Continue the pattern of the rounds until you have the length desired. Keep in mind that the decreasing rows that follow will measure approximately four inches. Increase the beginning ch for the fin pattern to 32 chs. Add eight rows to each fin, ending with Row 26. If you don't want to leave the boys out, a simple color change could be all that is needed to provide your little guy with a comfy blanket for his reading and fishing dreams. Use any colors you like to create unisex tails for the whole family.